This month at Tama Plaza Baby Room, April brings showers and a plethora of new Themes. The 2019-2020 official curriculum has been crafted! This coming academic school year will be fun, exciting and introduce our brand new and preexisting students the wonderful world of the English language. We will be learning Body and Feelings as our monthly themes. With the aid of songs, games and activities in the classroom, we are sure to captivate the minds of our students this year. “How many fingers do I have, Sensei Alex?” A student asks Alex sensei a question. 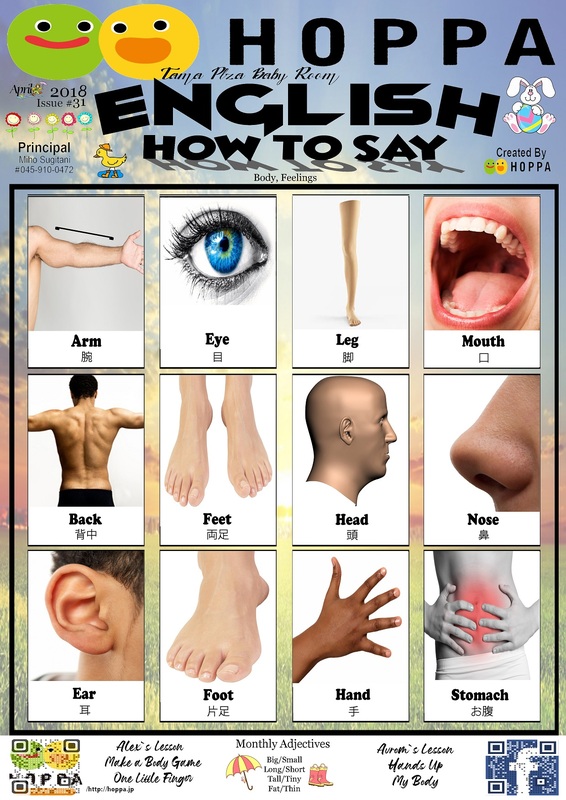 “The body” is a practical introduction to learning English and we plan to discover new ways to shake, rattle and roll. Let the fun begin! I can put on my jacket all by myself, Avrom Sensei. Avrom sensei replies. “Make sure to button up your coat, it’s still a little cold outside”. To build a solid foundation to support the Body theme, we will also introduce Feelings as a theme. What better way to learn how to communicate than to practice our emotions. Lets all smile together and bring in the new year! Tama Plaza Baby Room teachers are ready and super excited to present a fun filled first touch English experience. Our hope is that the baby room students will enjoy and establish a love for learning a second language. The seeds of English will be planted with the start of the academic school year and we can’t wait to see what beautiful flowers blossom in the coming months.